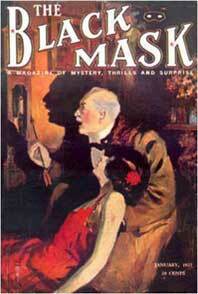 In addition to his general Introduction, Deutsch provides an account of his own involvement with Black Mask: “Over the years since I first edited and produced the last newsstand issue of Black Mask Magazinein 1974, I have been asked many times to tell how I acquired the rights to this famous magazine. 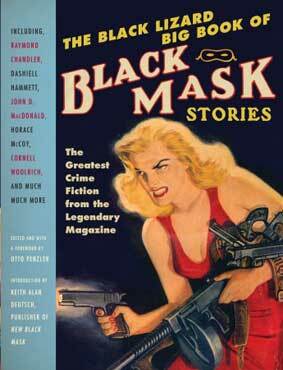 Because the history of Black Mask is intimately entangled in the history of fiction magazines in America, I thought I would tell my own personal history of Black Mask against an idiosyncratic history of American magazine publishing.” It’s a fascinating story! 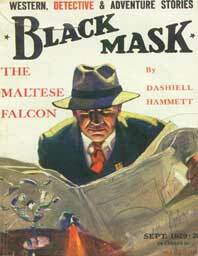 The Black Lizard Big Book of Black Mask Stories is 1,136 pages long, and contains over fifty stories, including the whole of the original Black Mask version of Hammett’s Maltese Falcon, which was serialised from September 1929 to January 1930 and to which some 2,000 revisions were made for the hardback version published by Knopf. It also includes Chandler’s “Try the Girl,” his last story for Black Mask(January 1937) and one of three stories cannibalized to form the basis ofFarewell, My Lovely; and six connected Jo Gar stories by Raoul Whitfield writing as Ramon Dacolta – Rainbow Diamonds, never before published in book form. The collection reprints stories by Erle Stanley Gardner, John D. MacDonald, Frederic Brown, George Harmon Coxe, Frederick Nebel, Brett Halliday, Day Keene, Steve Fisher, Horace McCoy, Bruno Fischer, Carroll John Daly, Cornell Woolrich and over thirty more writers. Each is concisely introduced, with an overview of their lives and their work for the pulps, their series characters, novel writing, film and TV scripts. AUTUMN 2013: NEW FROM BLACK MASK MAGAZINE – A new book line of fiction from Black Mask Magazine, THE BLACK MASK LIBRARY, is emerging this Autumn. Forthcoming publications include important new collections of the work of Theodore A Tinsley and Paul Cain: Theodore A. Tinsley, Jerry Tracy, Celebrity Reporter (Black Mask), Introduction by Boris Dralyuk, MysteriousPress.com/Open Road, 29 October 2013 – available on Amazon; and Paul Cain: The Complete Stories (Black Mask), Introduction by Boris Dralyuk, MysteriousPress.com/Open Road, 17 December 2013 – available on Amazon.